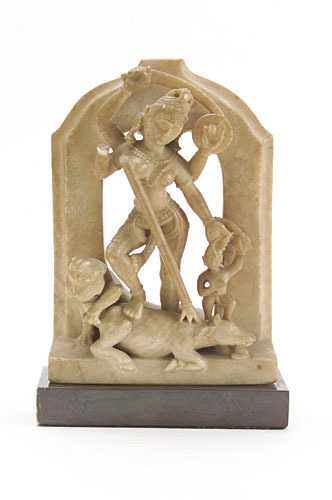 Durga standing with her right foot resting on the back of the slain buffalo (Mashisha), holding the hair of the demon with her left hand, her lion biting the haunches of the buffalo. 印度女神杜爾伽(Durga)馴服牛魔摩希沙(Mashisha)像. 古書記載,摩希沙魔力高強,天神不敵求援. 梵天,濕婆,和畀溼奴聞訊大怒,從臉上發出三道光芒,創造出女神杜爾伽. 杜爾伽四臂各持武器,並以喜瑪拉雅山的老虎為座騎. 馴魔過程中,摩希沙不斷變化形體,最後在變成水牛時被馴服. Durga's lower right hand and top of spear fragmentary as evident in photo. Otherwise very good condition. Minor abrasions to surface. Staining and discoloration to marble overall.